MIDTOWN, Manhattan (WABC) -- Several buses spun out and became stuck across New York City Thursday as the area was walloped by a snowstorm. 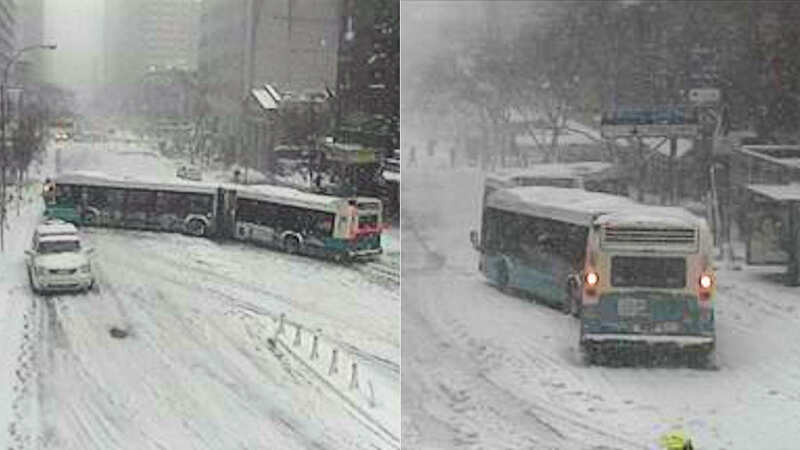 At least 15 buses got stuck in one hour, mostly in Manhattan and on Staten Island. The MTA was towing them out. One incident happened at 34th Street and Lexington Avenue, while another became stuck at 34th Street and Park Avenue. The system has brought heavy snow that created slick and hazardous travel conditions, and New Yorkers are being urged to avoid driving except in emergencies. "I want to emphasize to all New Yorkers, stay inside if you can," Mayor Bill de Blasio said. "Don't go out if you don't have to. If you need to go out, please don't use your car, because we need to let our sanitation department clear the roads." Approximately 10 to 14 inches of snow accumulation is expected by the end of the storm.